If you travel abroad frequently then street food probably isn't anything new to you. From street stalls lining the streets of Bangkok to crepe carts in Paris street food is a part of the culture of many countries. However, while there are a lot of things that America may not be slow on the uptake with, street food is something that hadn't quite taken off - that is until recently. A movement is starting to sweep across metro areas in the U.S., with pushcarts and food trucks offering everything from tacos to grilled cheese to crème brûlée to falafel and much more. Below you'll find some of the top cities for street food in America. The San Francisco area doesn't quite have as many street food vendors as some cities in the U.S., but what the Bay Area excels at is mobilising the effort. During lunch and dinner hours throughout the week, you can find pushcarts and food trucks gathering in different neighborhoods each day. Sometimes these are only a few, while other times it's as many as 30. 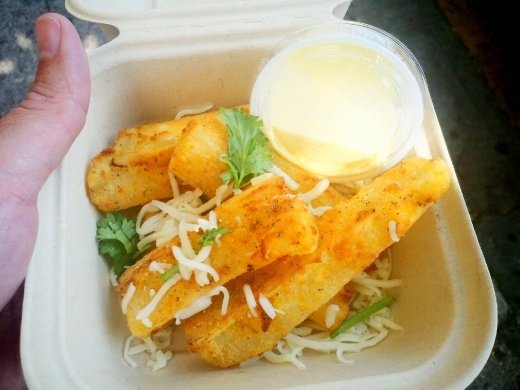 This street food movement in San Francisco is put together by an organization called Off the Grid, bringing the area's best street food vendors together daily to showcase their food. The main event is on Friday nights at Ft. Mason, when 25-30 vendors gather for a night of good food and live music. 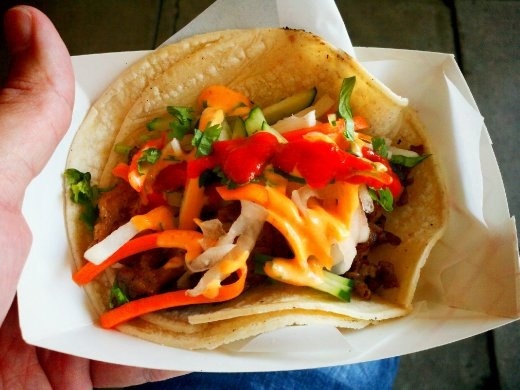 If you've never been to Portland, than you may be surprised to find so many food trucks. Many consider Portland as the food truck capital of America, since it has over 400 food trucks. If you can think of something you want to eat, you're likely to find it in Portland and you're probably not going to have to go out looking for it with so many vendors. You'll often find pods set up throughout Portland during meal times so you don't have to stand and eat. It's no surprise that the largest city in the U.S. would be on this list. You can typically find at least a pushcart in almost any neighborhood in Manhattan, but you'll find NYC's best street food vendors gathering near major landmarks and neighborhoods like the New York Public Library and the Financial District. At lunchtime, make sure you arrive early (before noon), if you don't want to stand in line. All this leads up to the Annual Vendy Awards, a street food cook-off on Governors Island, putting the Big Apple's best street food vendors against one another. L.A. ranks right at the top as one of the cities with the most street food vendors. As expansive as the city and surrounding area is, this is no surprise. However, because it's so expansive, it can be a little more difficult to find food trucks and pushcarts. However, the draw to L.A.'s street food scene comes down to one thing: tacos. You'll find a wide variety of street food vendors around L.A and Orange County, but you'll have no problem finding one of L.A.'s signature taco trucks, which are second to none. In Philadelphia, it comes down to just three words: Philly Cheese Steak. Philadelphia is the Philly Cheese Steak capital of the world and you've done yourself a great disservice if you visit and don't have at least one cheese steak. You'll find most of these in Downtown Philadelphia, with some parking at the same spot every day and others stopping at different locations. Philadelphia just recently wrapped up their own first Vendy Awards. While food trucks and pushcarts often cater to locals who are on short lunch breaks from work, they can also accommodate the traveler who has just a few minutes between his next tour. It's akin to fast food, but so much more fresh and delicious. In-between activities like the Smithsonian Museum and the Washington Monument, street food can offer a convenience for travelers to D.C. Street food has taken some time to take off in D.C., but looser regulations have opened the door for more pushcarts and food trucks, with many gathering around lunchtime in Downtown Washington, D.C. While you may not exactly be venturing out during the cold winter for a treat from one of Denver's food trucks, mosts times of year are pleasant for enjoying lunch outdoors from one of the city's many food trucks. It's growing so much that Anthony Bourdain was recently visiting Denver food trucks for his show No Reservations on the Travel Channel. The best time of year to experience the Mile High City's street food for yourself is between June and September for Civic Center EATS Outdoor Café, which brings together some of the best food trucks on Tuesday and Thursdays at lunchtime. Spencer is a traveling writer, who currently calls San Francisco home after living on the east coast for most of his life. He writes regularly for Web and print publications. While Spencer has traveled around the world, Europe is his first love, a love that is sustained back home by micro brews, fish and chips, soccer and golf. You can find him at The Traveling Philosopher or on Twitter. Yum. San Francisco has the best food trucks. Have you tried Kara's Cupcakes from The Kara Van?